Stunning Crete is the largest of the Greek Islands, and also the fifth largest in the Mediterranean. It boasts gorgeous beaches and mountains and is dotted with quaint villages. 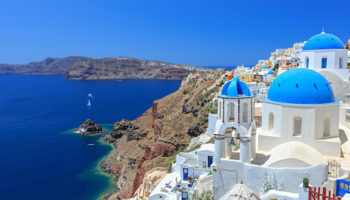 During the Bronze Age, this beautiful island was the home to the Minoan civilization, which is considered to be the first advanced European civilization, so there are also many historical attractions in Crete. 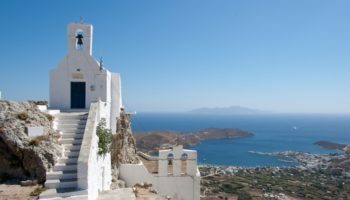 Besides Minoan ruins, visitors can also still see the remains of Ancient Greece, the Venetian era, and the Ottoman period scattered around this island today. The Arkadi Monastery was the site of one of the most tragic incidents in Crete’s history. In 1866, the Cretan residents, who were then under Turkish rule, decided to revolt. At one point during the rebellion, more than 940 Greeks, mostly women and children, took sanctuary in the monastery. The Turks lay siege to the monastery for three days and were finally able to break into its gates. At that point, the refugees decided to end their lives rather than be taken prisoner, and blew up barrels of gunpowder, which ended up killing hundreds of Turks and Cretans. The incident sparked sympathy and worldwide attention for the plight of the people of Crete. The monastery, which has been around since about the 12th century, was restored in 1870. The old town of Rethymnon (or Rethimno) is located in the midst of the modern city and features a rather unique blend of Venetian and Crete architecture. 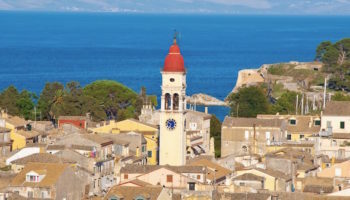 Rethymnon was established in 1204, after the Venetians had conquered Crete, so most of the remaining buildings in the old town area are of Venetian creation. 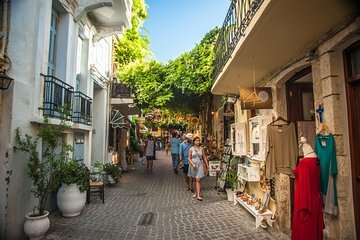 The Old Town’s narrow streets and its small Venetian harbor are wonderful for walking, shopping, enjoying dinner at a small tavern and taking in Rethymnon’s remarkable architecture. Travelers will want to check out the nearby Fortezza Castle, which was built in 1590, and sits on a low hill in the middle of Rethymnon. 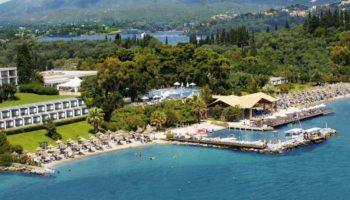 Situated on lovely Mirabello Bay in eastern Crete, Agios Nikolaos offers visitors a mix of the modern and the traditional. It is a medium-size port town that is extremely picturesque and has some style and charm, which it exploits to the full. The town’s Lake Voulismeni, which is lined with charming small cafes and boutiques, has been the subject of a number of legends. 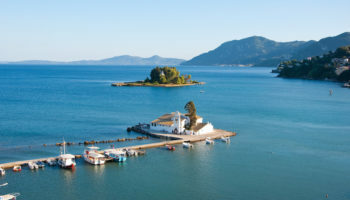 One myth is that the goddess Athena used to bathe in this almost perfectly circular body of water. Another legend claims that this beautiful lake is bottomless. 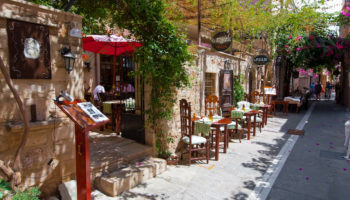 Agios Nikolaos is one of Crete’s most popular tourist destinations. While all of Crete’s beaches are beautiful, there is something very special about the beaches that can be found on the island of Elafonisi. Located in South-west Crete, Elafonisi is separated from Crete’s shores by a very shallow lagoon. In fact, it is so shallow that visitors can easily walk the 200 meters (650 feet) to the island. The waters around this island are crystal clear, and its sand ranges from sparkling white to a soft pink hue. This island’s beaches are very popular with locals and visitors, so it can be a bit crowded in some areas. Travelers who want to avoid the crowds can just walk a little farther in, where they’ll find plenty of nice, quiet spots. Spinalonga is an island fortress on the southwestern entrance to the Gulf of Elounda. It used to be part of the nearby Peninsula Spinalonga, however in 1526, the Venetians cut a canal through it to separate the two. The island was also fortified and, for many years, was the first line of defense for Elounda. From 1903 to 1957, Spinalonga, was used as a leper colony for people from all over Greece who were suffering from the disease. Today, Spinalonga is just a short boat ride away from both Elounda and Agios Nikolaos and is popular with tourists, who come to the island to see the remnants of the abandoned leper colony, the fortress and numerous old structures. 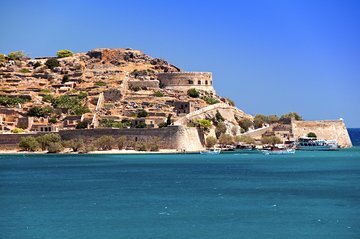 However, visits to this island are limited to a few hours, as there are no accommodations on Spinalonga. The Heraklion Archaeological Museum enjoys the reputation of being one of the most important museums in Greece, especially when it comes to its collection of Minoan artifacts and artwork. Visitors to this museum can enjoy seeing fragments of the original frescoes from the Minoan Palace of Knossos. The Heraklion Archaeological Museum also has exhibits dedicated to all of the periods of Crete prehistory and history, up until the late Roman periods. 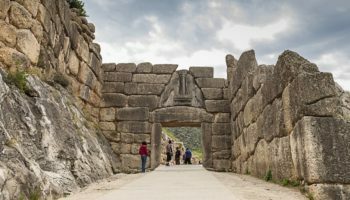 Highlights include statues of the Snake Goddess, the famous Bull-Leaping Fresco and the enigmatic Phaistos Disk. In addition, the artifacts found in this museum were all discovered in Crete. One of Crete’s most beautiful beaches, Balos Lagoon is located near the town of Kissamos. Sandwiched between the small island of Imeri Gramvousa and Crete itself, the beach is accessible by boat or car. Visitors are greeted with a stunning vista created by an outcropping of rock that is surrounded by pink sand and blue and turquoise water. This is arguably the most photographed natural attraction in Crete, which causes tourists to visit in massive numbers. The months of July and August are the busiest. This harbor was built between the years 1320 and 1356 by the Venetians and was an important trade center until the early 20th century. The harbor could not accommodate larger ships, so the port was eventually abandoned by big vessels in favor of Souda’s harbor. Today, though, Chania’s old harbor is still used by smaller boats and yachts. The harbor’s crowning jewel is its lighthouse, which was built by the Venetians around 1595 to 1601, and is one of the oldest in the world. 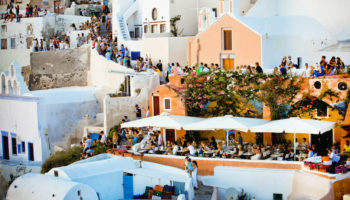 Most people come here to enjoy a stroll through the harbor, sip their coffee or have breakfast with a view of the lighthouse or enjoy a meal in one of the many restaurants and ouzo shops. Some sites require more effort to enjoy than others, and Samaria Gorge is one of those. Located in the National Park of Samarai in the White Mountains, this stunning gorge is a ten-mile downhill hike that ends at a black-sand beach in Agia Roumelli on the Libyan sea. It passes through forests of ancient cypresses and pines, then cuts between vertical cliffs through the mountains. 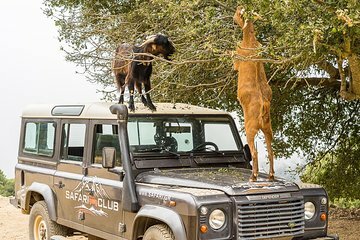 Depending on a person’s speed and fitness level, this hike can take between four to seven hours. At the end of the trek, most hikers hire a boat to take them to Chora Sfakion. Located some 5 km (3 miles) south of Heraklion, the Palace of Knossos is the most important and best known Minoan site in Crete. 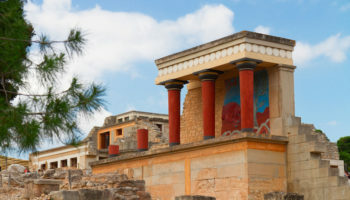 Knossos is also often associated with the legend of the Athenian hero Theseus killing the Minotaur. The great palace was built gradually between 1700 and 1400 BC, with periodic rebuildings after destruction until it was devastated once and for all by fire. Knossos incorporated numerous rooms such as the Throne Room, named for a large chair that is built into the wall, facing several benches. The main function of the palace is still under debate. It could have been used primarily as an administrative or a religious center.